Vine fruits can fit into your landscape where there might not be room for a tree, and many will produce edible fruit for years after planting. They can be grown in many different parts of the country with excellent results. Some vine fruits are commonly seen, but others might not be so familiar. When it comes to crops planted around the world, grapes (Vitis spp.) hold the number one spot, with more acres of land devoted to grape growing than anything else. With over 60 species and 8,000 varieties, there's a grape for just about any taste and location. Grapes flourish within U.S. Department of Agriculture plant hardiness zones 4 through 10, though some varieties have a more limited range. Grapes grow on vines that can be as much as 50 feet in length with around 40 clusters of grapes on each vine; each cluster has about 75 grapes. Blackberries (Rubus spp.) and raspberries (Rubus spp.) are just two of the many different kinds of berries that grow on vines. While the plants are technically referred to as canes, it is common for people to refer to them as vines and to call a large area of these thorny growths brambles. The roots of berry plants are perennial and survive for many years, but the parts that grow above ground don't usually last more than two or three years, depending on the particular plant. Once a cane has produced fruit it should be cut away, as it will die soon after fruiting. 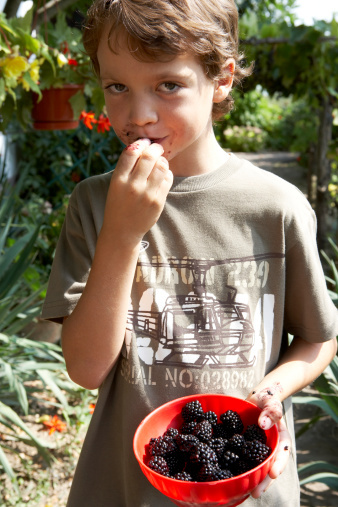 Raspberries thrive in USDA hardiness zones 5 through 7, while blackberries grow well in zones 3 though 9. They are often grown on trellises or other supports to improve the quality of the fruit. Melons, members of the Cucurbitaceae family, are annual plants that grow as vines. Commonly grown types include watermelon (Citrullus lanatus), cantaloupe (Cucumis melo) and honeydew (Cucumis melo inodorus). Melon plants can sometimes take over a large section of your garden as the vines spread out and sprawl across the ground. Gardeners without a lot of space can still fit melons in by erecting a sturdy trellis and training the vines to grow up it. Because melons can get quite heavy as they develop, select smaller varieties of watermelons for your vertical garden or they may break off before they are ripe. Each melon on a trellis -- even smaller types -- needs to be well-supported with a sling made from netting, an old t-shirt, pantyhose or other suitable fabric with a bit of stretch to it. Some vine fruits are not seen as often as grapes, berries or melons, but they can be fun and rewarding to grow. The purple passionfruit (Passiflora edulis) is a tropical fruit that is a native of Brazil and needs warm weather to survive. It won't do well outside of USDA zones 10 through 12. It grows up to 15 feet high if supported and produces an edible fruit approximately 80 days after the plant has bloomed. Kiwifruit (Actinidia deliciosa) is a small, fuzzy fruit about the size of a hen's egg. It is native to China and was brought to the United States in the early 1900s. Typically the kiwi is trained on a trellis about 6 feet high with plenty of room for the vine to travel horizontally as it grows, which can be up to 30 feet in a single year. This plant is hardy in USDA zones 7 though 9. The hardy kiwi (Actinidia arguta) is perfect for kiwi fans who live where it is too cold to grow standard kiwifruit. The fruit is about the size of a large grape with smooth skin, but the flavor is much like its larger cousin. The hardy kiwi's vine grows more slowly than regular kiwi, no more than 12 feet per year. This plant will thrive in zones 4 through 9. Dragonfruit (Hylocereus undatus) is a tropical climbing cactus with aerial roots that can cling to trees and other supports. When the fruit develops it can weigh up to 2 pounds and has an unusual, scaly appearance. It grows in USDA zones 10 and 11. A recipient of a business and technology degree from the master's program at West Coast University, Cindy Quarters has been writing professionally since 1984. Past experience as a veterinary technician and plenty of time gardening round out her interests. Quarters has had work featured in Radiance Magazine and the AKC Gazette. What is the Fastest Growing Fruit Tree? In What Areas of the United States Can You Grow an Avocado Tree?